The start-up is known for its gesture sensing and analytics technology that promotes mindful eating and proper hydration. Now, the company aims to use patented technology to create “never-seen-before” capabilities in the realm of treating type 1 diabetes. By using software, it plans to unlock solutions that will be life-changing for patients who have had a lifetime of daily injections and blood sugar monitoring. Klue’s fine motor artificial intelligence technology detects high impact moments and allows individuals to better manage their health, all based on insights that are captured automatically from analyzing their wrist movements. The device then coaches its users around those events, for example, by sending them bolus reminders. Klue’s AI technology, however, is much more than tracking and providing reminders. “It is much more than that,” Sander Arts, Klue’s CMO tells dLife. Arts explains that Klue has essentially created a new kind of engagement channel. Arts says those messages are real-time and can be highly personalized. Current examples are Klue’s mindful eating program: Users get on the go, personalized coaching which goes way beyond reminders. Klue’s early meal detection capabilities and unique insights into eating behaviors are critical components towards the realization of a fully autonomous artificial pancreas system, which Klue would do in collaboration with another partner. The module, specifically designed for individuals with type 1 diabetes, works seamlessly with hardware such as the Apple Watch. The module also features automated text messaging, keeping caregivers connected and offering peace of mind for loved ones who are concerned. Breton says automated real-time information of a patient’s eating behavior, coupled with novel control algorithms, may very well enable a true ‘set and forget’ closed-loop insulin delivery system. “This would be a game changer in decreasing the daily burden of diabetes and achieving optimal glycemic control for people with type 1 diabetes,” he adds. 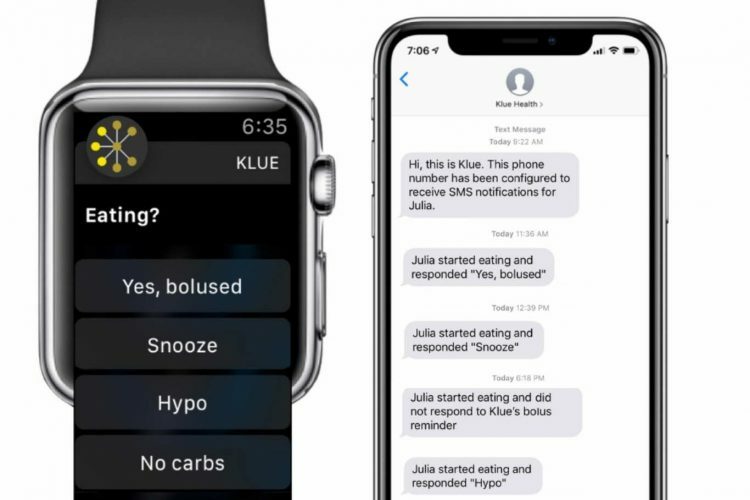 Klue is inviting individuals with type 1 diabetes to try out their new bolus reminder module in the Klue Health App for the Apple watch ahead of general availability. You can sign up here https://goklue.com/t1d. Klue will be showcasing its new offering on November 2 at the 2018 DiabetesMine™ D-Data ExChange taking place at UCSF’s Mission Bay Conference Center.